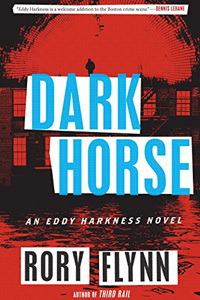 Dark Horse by Rory Flynn: Synopsis and Online Purchase Options. Synopsis (from the publisher): When a late-summer hurricane slams into Boston, Detective Eddy Harkness and his Narco-Intel crew are thrown into the eye of a very different kind of storm. Dark Horse — an especially pure and deadly brand of heroin — has infiltrated the gritty Lower South End. Harkness soon finds that the drug is also at the center of an audacious land grab by the city's corrupt new mayor and his shadowy power brokers. Meanwhile, Lower South End residents displaced by the storm use an obscure bylaw to move into Eddy's hometown, and soon enough tensions are running high along Nagog's tree-lined streets.